You can use Apple's code to make it easy to enable finger interaction with your apps. This course is awesome. It will save you time. You won't spend weeks trying to get it to work right. The code samples are taken from two of my published iPhone apps, Photo Table and Artwork Evolution. You'll learn how to create a touch friendly app. 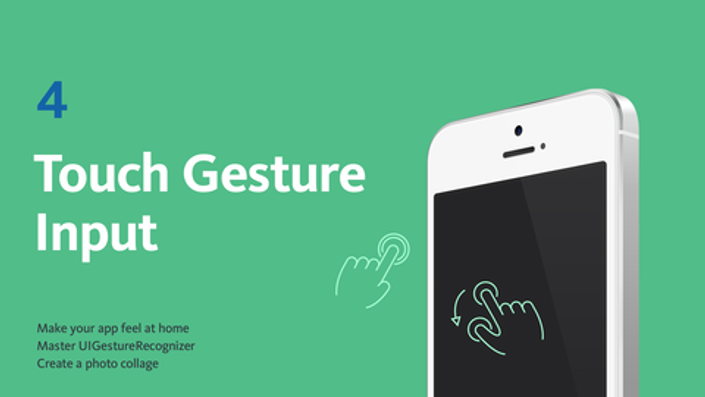 Many apps use gestures to make the app fun to use. Download Flipboard, Clear, Paper | FiftyThree, Paper | Stories from Facebook. Slide your finger, drag some text, swipe up and down. Each of these apps makes people smile because they use touch gestures to make complex tasks easy and convenient. At the end of the course you can test your knowledge and build a working picture and text collage app. Tap Enroll to start learning!